Whether you are passionate about vehicles or just looking for an introduction to building with an Erector¨ set, this kit is for you. 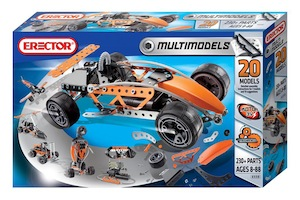 With over 230 pieces and 20 moving machines to build, this set has basic models for beginners as well as more challenging moving models that use the 3v motor (included). Unlike Erector¨ sets of old, powder-coated and galvanized chrome pieces give the models a stunning look and a rewarding feel when completed. It is one thing to know Òrighty tighty, lefty looseyÓ; it is another to use it dozens of times to create something that looks and works great!